With Motorola gearing up to launch the new handsets on September 4, the company is apparently planning to showcase the devices in India simultaneously. 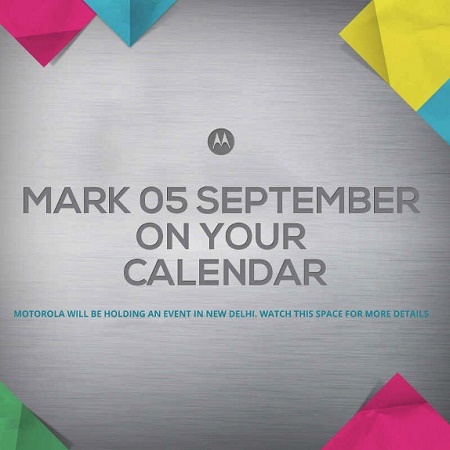 Motorola has started sending out press invites for an event scheduled to be held in India on September 5. Considering the timings could be on par with the US launch event, we can expect the event to showcase the Moto X+1, Moto G2 and the Moto 360 smart watch. However, the invite just says “Mark 05 September on your calendar”. While it is wonderful to see Motorola giving the Indian market top preference, just like it did with the Moto E, we may just get to see the devices at the event, as we suspect that the devices would be released in the market at a later date. Either ways, it will be great to see the upcoming successor to the Moto X and the Moto G (which took Motorola to fame in India) as well as the smart watch.